The Texas politician hasn’t declared yet, but his challenge to a border wall continues to rankle the president. EL PASO, Texas — The feud between President Donald Trump and Beto O’Rourke over immigration resumed at a distance Tuesday, driving the politics of a border wall further into the 2020 presidential campaign. The opposite of that assessment appeared to be true nearly 2,000 miles away in the border town of El Paso, where O’Rourke did not announce his run for president on Tuesday — but might as well have. The call and response laid bare the durability of an issue that defined the 2016 presidential race — and is shaping the earliest stages of the 2020 campaign. After the dueling rallies, O’Rourke traveled to the Midwest to meet with students in Milwaukee and Madison, Wis., before speaking at a gathering of the United States Hispanic Leadership Institute in Chicago on Saturday. He has placed Trump’s call for border wall funding at the center of his likely campaign, arguing that walls are not only ineffective at reducing crime — a point supported by statistics in El Paso — but also that they endanger immigrants by encouraging them to cross the border in more remote locations. In recent weeks, O’Rourke has outlined proposals for extending citizenship to undocumented people known as Dreamers — who were brought the country illegally as children — and offering a path to citizenship for other undocumented immigrants. And his remark on MSNBC that he would remove existing barriers in El Paso forced other Democrats to respond. 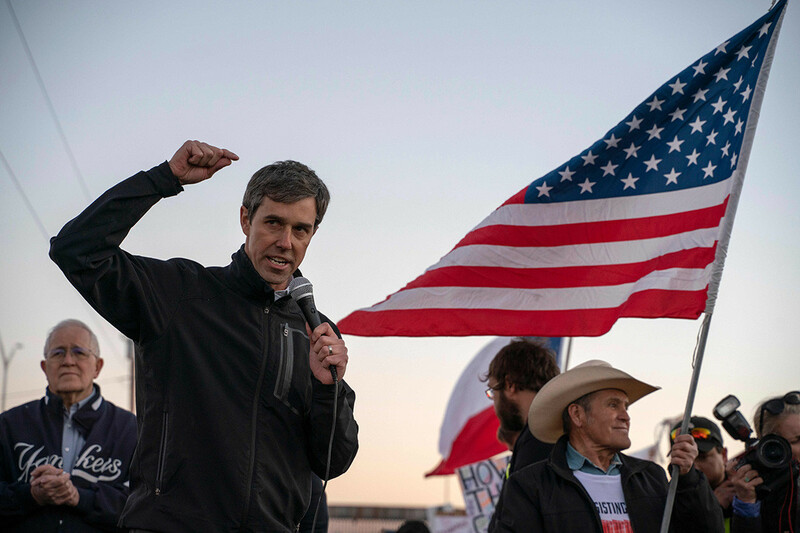 On Tuesday, O’Rourke expanded on his remarks to MSNBC, telling reporters that “there is a role for physical barriers in some places” and that he would not necessarily remove border fencing in areas outside El Paso. For Democrats confronting a looming general election campaign against Trump, the politics of immigration are fraught. A POLITICO/Morning Consult poll last week suggested that the American electorate is split on the construction of a border wall, while earlier polls indicated that the subject resonates more strongly with Republicans than Democrats. Even in El Paso, some supporters fret about O’Rourke focusing so heavily on a subject that Trump used to win election in 2016. O’Rourke’s remarks came after Sanders, a self-described democratic socialist, announced that he would run again for president in 2020. O’Rourke was a superdelegate for Hillary Clinton atthe 2016 Democratic National Convention and said he voted for her in the primary. O’Rourke, who has been in talks with potential campaign strategists about a 2020 run, said he plans to decide within two weeks whether he’ll enter the race. But he said he “won’t be limited” by that timetable. O’Rourke did not rule out running for Senate or some other office. “I’m trying to figure out how I can best serve this country,” he said. O’Rourke talks about El Paso relentlessly, casting the West Texas city as an example of a diverse community reveling in its multiculturalism. Situated across the border from Juárez, Mexico, El Paso County has a population that is more than 80 percent Hispanic, and the region stands as a Democratic oasis in a heavily Republican state. In a video played in the city Tuesday, House Speaker Nancy Pelosi (D-Calif.) and Rep. Joe Kennedy (D-Mass.) praised O’Rourke for the award he was receiving. Kennedy said that for as long as he had known O’Rourke, the Texan had always sought to “elevate” his hometown. When O’Rourke took the stage, he joked that he wasn’t sure until he saw the video that Pelosi knew he existed.